There are very feelings as satisfying as when you connect with your prey. Hunting is a thrilling and challenging experience, but the right tools do make it easier! That’s why I recommend the Oregon 600t as the best Garmin GPS for hunting. I’ve been with mine several times and am confident it out performs the competition. Of course, you can choose to go hunting without a GPS. But, I’ve fund them to be exceptionally beneficial. After all, what better way is there to mark your most successful spot than on your GPS? You won’t be leaving a trail for others to follow. I’ve been hunting for a few years and have to say, the GPS makes sure I don’t overlook the simplest of details; such as which stand works best in a north wind. The fact that I can always find my way back to the truck is a big bonus! Despite being around for nearly 5 years this is a magnificent bit of kit! 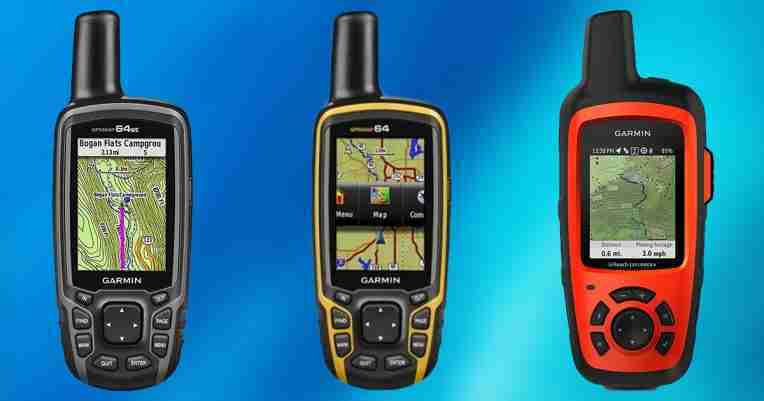 The 600t uses Garmin’s latest user interface which makes finding the settings you need a very simple process. One of the best parts of this is that the screen actually tilts and changes direction in the same way as your cell phone screen. This makes it very easy to work out where you are and where you should be going. This feature is further enhanced by the fact that all the functions are operated via icon and are very easy to find. It is also nice to see that the screen can be personalized to meet your own preferences. The device was actually very easy to set up; it took me about 5 minutes without the use of the manual! 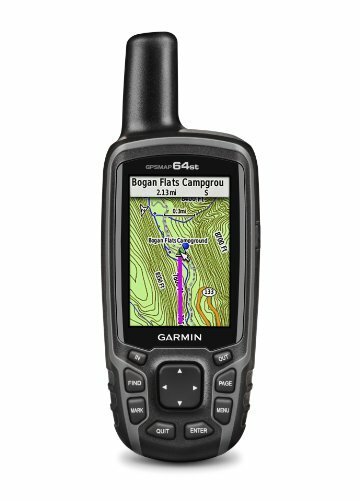 Garmin’s 600t also has the ability to track your route. This means you know exactly where you are and where you’ve been even when hunting in unfamiliar terrority. You also benefit from being able to set up multiple profiles and can access your statistics while hunting. You may even be interested to learn just how far you walk while hunting. The 600t can store 4,000 waypoints, 200 routes and 200 tracks; that should be enough for all your hunts! The size of this device is perfect to fit snugly in your hand. Your thumb will automatically sit over the right buttons in much the same way as you would use your phone. This makes it very easy to use with one hand while keeping an eye on the horizon and your gun ready. There are very few GPS units which give quite such an accurate picture of where you are and where you’ve been. The color screen helps it to bring your whole hunt to life; making it a pleasure even on an unsuccessful day. The map can be made smaller or bigger with your finger and thumb; just like on a cell phone This is an important feature if you are debating about whether to push on or not. You can quickly see how far it is back to the truck and which route you should take. It is worth noting that the screen is easy to read even in bright sunshine and responds well when the temperature is as low as the 30’s F or as high as 110° F.
The batteries in this unit are rechargeable. It is advisable to purchase the 1900mAh ones as this will help to ensure your batteries last as long as possible. You should e able to get 24 hours of continual use before recharging them; that’s enough for most hunting trips! Although the screen is excellent it is worth noting that moisture from sweaty hands or in the air will affect the screen. The Oregon is waterproof but moisture on the screen prevents it from detecting your finger movement properly. This makes it difficult to operate the GPS unless you dry the screen and your hands first. 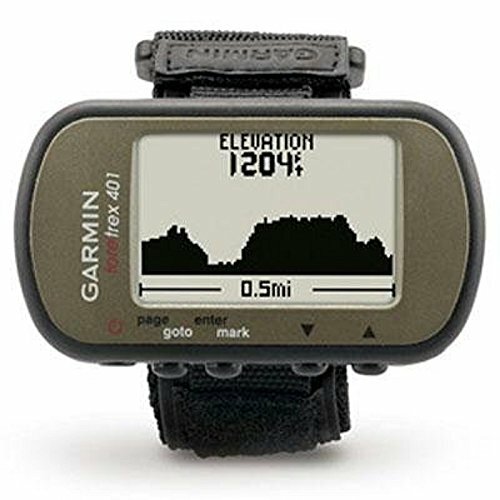 There is a handy accessories rail that comes with this Garmin GPS. However, it can be difficult to fit it into place at first. It is possible with a little patience and practice but this is definitely one area where Garmin could improve the device. You need to take the back off to add or replace the batteries. While it comes off easily it could be said that it was a bit too easy. The fact that it is easy to think you have clipped the back on when you haven’t means that you could lose the back or the batteries while in transit. You might not even realize until it’s too late. Users of this GPS have commented on how reliable the 64st is. It has a rugged look which is designed to protect the unit even if you drop it while hunting. It is built to function in all weathers and will not let you down. The 64t has large buttons. This is not to help those who are short sighted. The large buttons make it easier to get the GPS to complete the right function; even when your hands are wet or you have limited light. This more than compensates for the lack of a touchscreen. Once you’ve learned the right buttons you’ll be able to click your GPS without even looking at it; allowing you to remain focused on the animal you’re hunting. This model can connect to your cell phone in a matter of seconds. This allows you to upload additional maps or simply to record the important facts regarding your trip. The advantage of this, providing you have a cell signal, is that you can use an app live Livetrack to ensure others know where you are. This is exceptionally useful if you have an issue. Because it uses GLONASS as well as GPS there are very few places where you will not be able to get information regarding your location and find the right path. GLONASS is the Russian system which works extremely well in the northern hemisphere. As long as you’re unit can find a satellite you’ll know exactly where you are. Unfortunately you can’t add rechargeable batteries to this and then recharge the unit without removing them. That means you’re at the mercy of having enough battery life and always carrying a spare set; just in case. The base map supplied with the 64st uses bird’s eye technology which gives you a great view of where you are and the surrounding countryside. However, the quality of the base map is not great; it pays to add some extra ones which can be easily done via the internet. Providing you take the time to go into the settings and tell the eTrex 10 to use the most accurate settings then you’ll be very pleased with the results. Despite being a budget offering it remains able to pinpoint your location in most weathers. It does suffer a little in heavy fog but this unit is not alone in that respect. 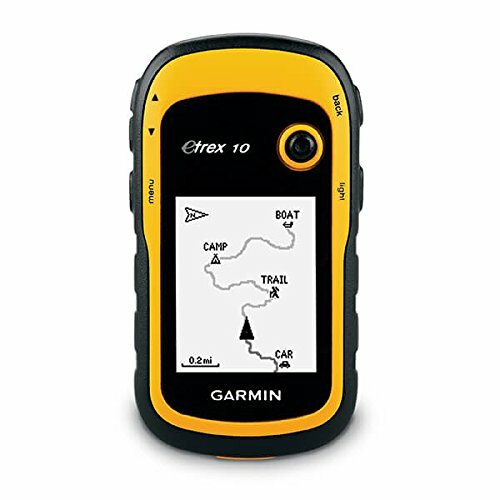 It is worth having a map and compass with you to compare and log your position; the eTrex 10 doesn’t have a color screen and the maps are not as detailed as they could be. The unit uses 2 AA batteries which means you can always have a spare set with you. It does allow the use of rechargeable batteries. It should last approximately 25 hours on a full charge, although obviously the quality of the batteries will affect the performance. This is with the unit on the whole time. You can simply switch it on and off when you need it; it will remember the waypoints and last satellites used. This is a great way to ensure your device doesn’t spook the animas while ensuring you can find your way where you want to be; and home again. The eTrex 10 is designed to be used in rain and will even continue working if you drop it. It is robust and should last through a number of adventures with you. This is a great option for anyone looking to start hunting or who has a limited budget. The features are basic and it lacks a color screen but this simply helps the battery life and accuracy. It does one job extremely well; tells you exactly where you are and you won’t find many units cheaper that can do this. Unfortunately the eTrex 10 uses a joystick to allow you to navigate through the different features. In principle this is great but in reality the joist stick is initially too sensitive. You can take several attempts to go into the right menu. A further downside to the joist stick is that after time it actually becomes less responsive and you’ll struggle to get it to go anywhere! This is because it sticks out of the unit and can be easily knocked while you hunt. This is a budget option but the instruction manual is not user friendly. It is likely you’ll be making several calls to Garmin before you complete the set-up of your device. In addition to poor instructions there are some features which are not even covered by the instruction manual! Wrist Mounted GPS system – easy to carry with you. The 401uses GPS only but is surprisingly quick at locating the satellites and finding your position. If you compare this to a map and compass you’ll note it is spot on. That’s impressive for a unit that is so small. The screen is black and white to conserve battery life. The information displayed is extremely clear and easy to read. That’s great when you’re hunting in bright sunshine and need to quickly see your position or where you last saw the animal you’re hunting. The 401 tells you exactly where you are, how far you’ve travelled, your elevation and even a barometer reading. It also has functions for jumping out of a plane but that’s because many military personnel use this unit. One function that is really worth noting is that you can share your GPS information with other 401 units. This may help if you are hunting as a group and need to know where everyone is. You can do this with the 401 without making a sound! The unit does not come with maps built into it. This is an issue if you want to mark your route or compare images. However, you can use an app to link your GPS unit with the web and access as many maps as you need. Despite the limited functions on this device the batteries (2 AAA’s) will not last much longer than 15 hours. This should be enough for most trips but if you’ve forgotten to put fresh ones in it could be an issue. All you need to go hunting without worrying is a GPS that accurately tells you your location and how to get back where you started. All of these units do this. But, the added features of the Oregon 600t, combined with its ease of use and high degree of accuracy make it the overall winner. 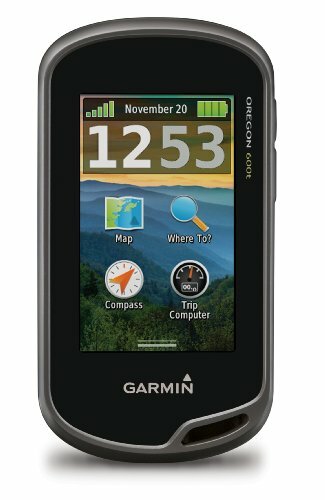 It’s the best Garmin GPS for hunting and the one I’ll continue to use.